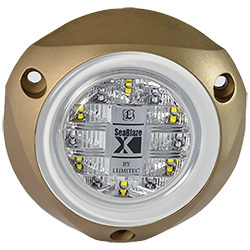 Illuminate the water around you — whether to attract fish or attention — with the Lumitec SeaBlazeX LED Underwater Light. With only a 1/2" hole needed for easy, 2-wire hookup, this surface-mount light features self-contained circuitry tested to military standards for EMI (electromagnetic interference), transient voltages, temperature extremes, and mechanical shock and vibration. Choose among three modes depending on what you're doing at the moment: constant green light, a fade and return to full insensity, or strobe. The bronze alloy housing is designed for underwater service life of more than 50 years, and the exclusive thermal fold back technology ensures the light can operate above water indefinitely without damage. SeaBlazeX provides a lower profile and smaller footprint than most other similar lights, which means you have plenty of mounting options.